The world's first 5K monitor is here. You can stop going outside now. Forever. The Dell UP2715K is too expensive to be practical, but we could stare at it for weeks. In September of 2014, before anyone had heard of the iMac with Retina display, Dell teased its own 5K monitor. The preview hinted at a beautiful 27-incher to be sold under the company’s premium UltraSharp brand at an astounding price of $2,500. Image quality enthusiasts across the globe drooled in anticipation, even if most couldn’t afford it. Then Apple stole Dell’s thunder by releasing its 5K iMac several months earlier, and at the same price. Some reviewers commented that the Dell monitor made the Mac seem like a better deal, as the iMac offers a computer and a monitor for the same price! The UP2715K pushes the boundaries of display technology. Actually, though, that statement is half-true. 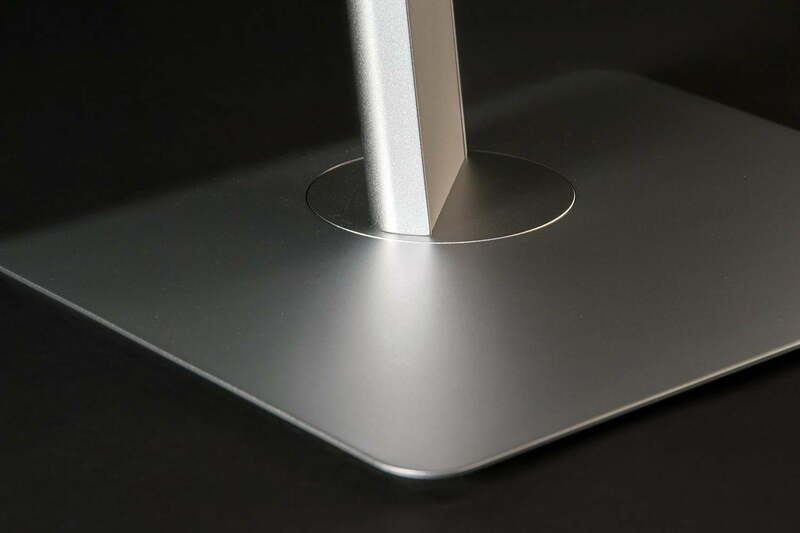 The iMac with Retina has a display, but it is not a monitor, because it can’t be used with any external video input. 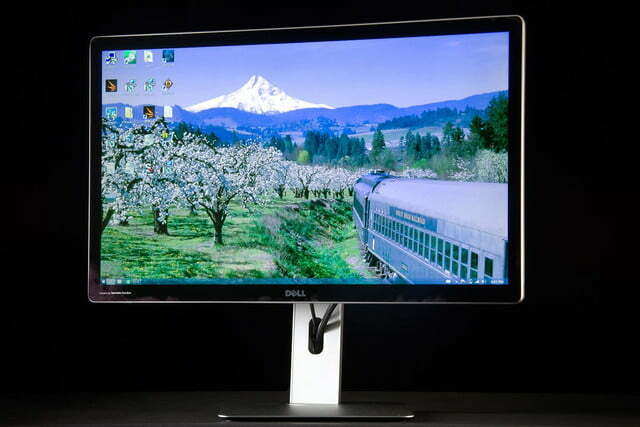 Dell’s UP2715K is a monitor, of course, so it’s not tied down to any particular hardware. Still, there’s no way to get around the fact that $2,500 is a ton of cash. The same dough will buy three of Dell’s wonderful, 4K P2715Q with a few hundred to spare. Can the company’s 5K masterpiece possibly justify its incredible expense? You’d expect over two grand to buy you a monitor that looks nice even when it’s turned off. Guess what? That’s exactly what Dell has delivered. The basics of the UP2715K’s design are similar to the more affordable P2715Q. It’s boxy, simple, and elegant. 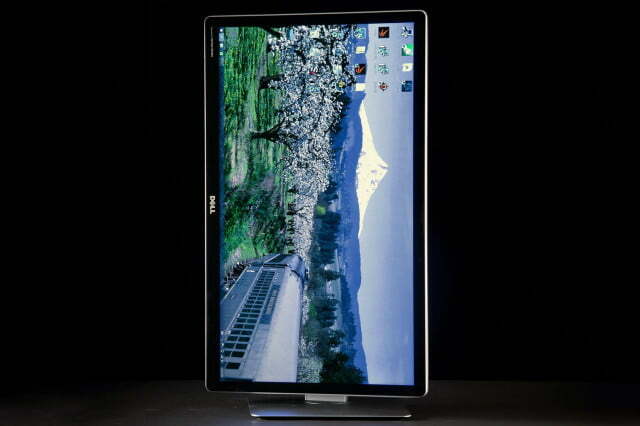 The 5K display has a glossy panel, however, which instantly catches the eye. That’s good, as it provides some distraction from the display’s thick, chunky dimensions. 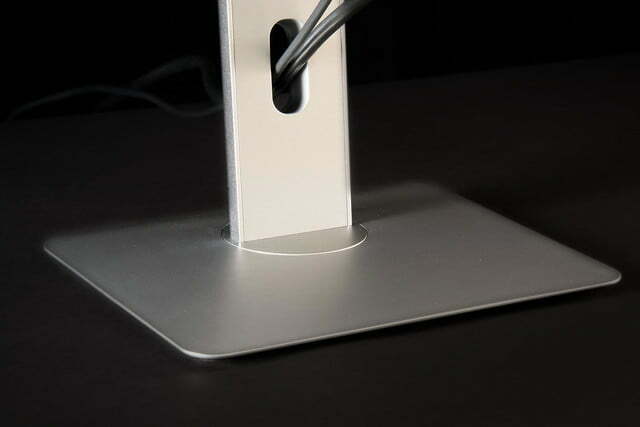 A wonderful stand with tilt, swivel, pivot and height adjustments keeps the 5K panel upright. There’s a wide range of available adjustment and the stand tracks smoothly, yet remains easy to operate with one hand. Functionally it’s identical to that shipped with the P2715Q, but Dell classes up the 5K model with a metal (rather than plastic) exterior surface. It’s a nice touch that makes the incredible MSRP more tolerable. The UP2715K comes with only two video inputs. 4K is obtainable over a single Mini-DisplayPort input, while 5K requires the simultaneous use of two standard DisplayPort connections. This unusual arrangement is due to the limitations of modern video connections. No single standard besides DisplayPort 1.3, which was just recently approved and not supported by any video device, can handle 5K. Dual DisplayPort 1.2 HBR2 is the only way to go, and that means the UP2715K can only be used with very particular hardware. You’ll need a compatible video card, such as Nvidia’s latest GTX 900 hardware, and quality cables. 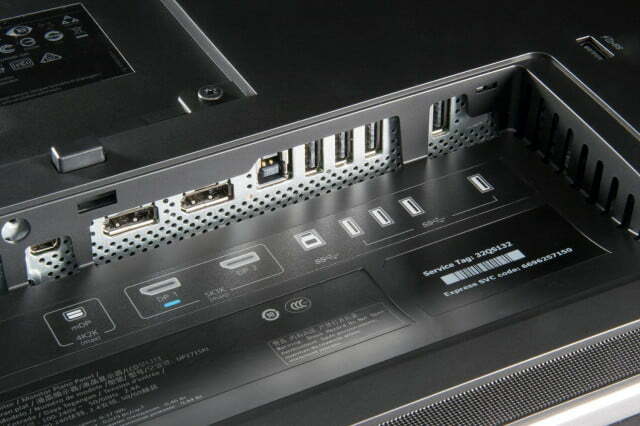 Extra connectivity is provided by four USB 3.0 ports, and makes the monitor a versatile USB hub. They are found only on the rear panel, though, so quickly connecting a thumb drive isn’t as simple as it could be. 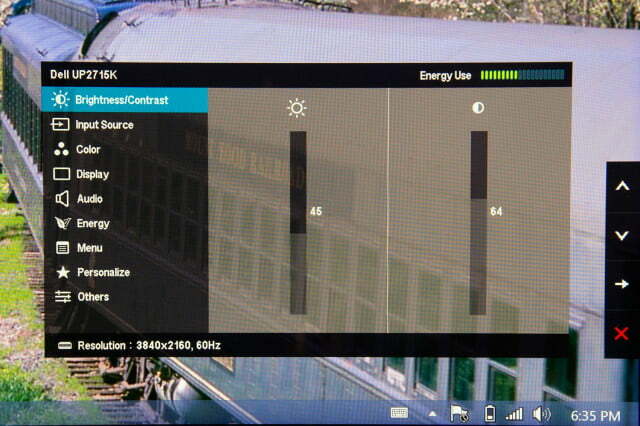 Dell has the best on-screen controls in the business. Four tactile buttons flank the lower right side of the display, as is typical. Unlike most models, though, the buttons are hidden from view behind the bezel. That can make them hard to use at a glance. 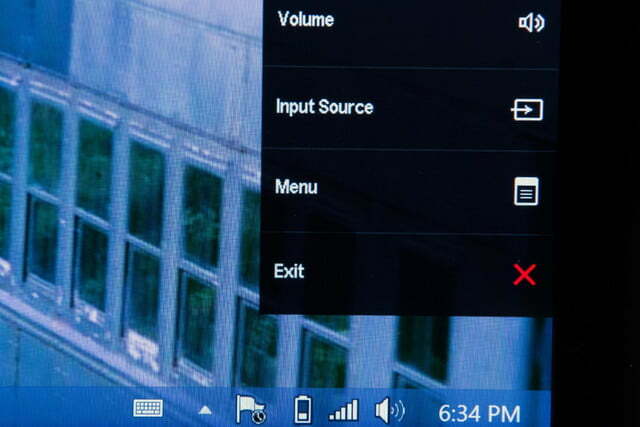 Navigating the monitor’s menu is easy because of the simple layout, but there are surprisingly few options. Quality controls are limited to brightness, contrast, and a few preset color modes. Gamma can only be adjusted between “PC” and “Mac” settings. Color can be adjusted for gain, saturation and hue in the Red, Blue and Green spectrums. These are respectable controls, though not class-leading, as there are some monitors that provide adjustment for Yellow, Cyan and Magenta as well. In the lower left hand corner of this monitor is an unexpected brand; Harman/Kardon. Monitors often deliver audio, but the 16-watt speakers in the UP2715K are huge leap above the norm. They provide clear sound, a hint of bass and enough volume to fill large room. 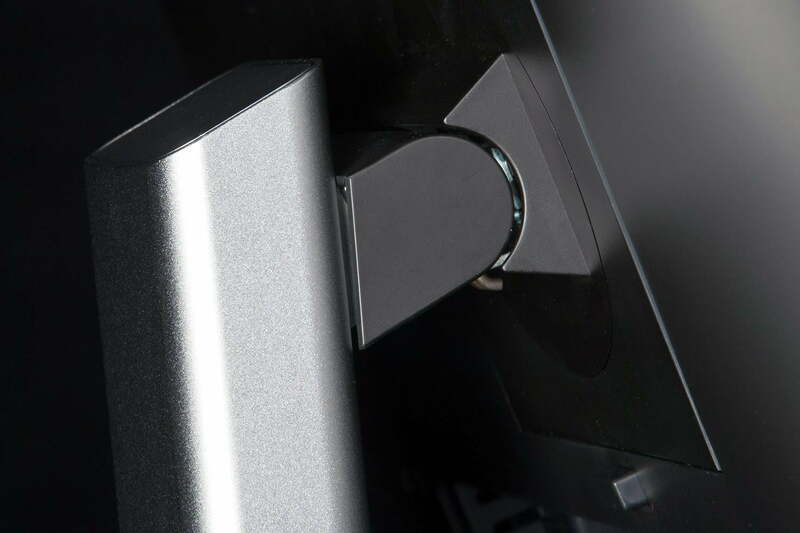 However, like most bundled monitor speakers, stereo staging isn’t great and tracks with significant low-end umph can overwhelm the subwoofer-less system. OK, but how’s the picture? Obviously this display has some drawbacks. 5K only works with very specific video input, the on-screen controls offer limited options, and the price is high. These problems are quickly forgotten once you hit the power button. Viewing 5K photographs on this monitor is like staring through a window. Even under Windows, which is not well optimized for high pixel densities, the UP2715K looks absolutely stunning. Viewing 5K photographs on this monitor is like staring through a window. Web pages packing high-resolution content are a treat, as well, and the panel’s handles even the finest fonts as if they were printed on paper. And there’s more to it than just pixel count. We measured a gamut spanning 100 percent of sRGB and 96 percent of AdobeRGB out of the box. Contrast was 650:1 at maximum brightness, or 630:1 at half of maximum, with respectable black levels and a maximum luminesce of 249 lux. Average color difference came in at a mediocre 2.1, but unlike many monitors, it wasn’t all concentrated in cyan or blue; instead we saw low levels of inaccuracy in most colors. These results are impressive, but there are monitors that perform better in one area or another. 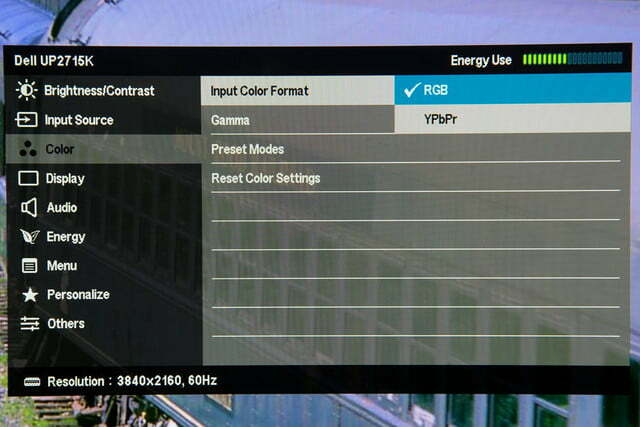 Samsung’s U32D970Q, for example, has much lower contrast but also far superior color accuracy. Dell’s own P2715Q has a narrower AdobeRGB gamut, at just 80 percent, but higher contrast and better color accuracy (which seems odd, given its $700 price). The UP2715K does not defeat every competitor in every metric, but it does post solid scores across the board. Normally we’d break our review into a separate section for post-calibration results, but that’s unnecessary here. The slim hardware calibration options means the Datacolor Spyder4Elite software we use for display testing was left to do the heavy lifting. While it did drop the average color difference to 1.4, a significant improvement, gamut, contrast, and black levels refused to budge. 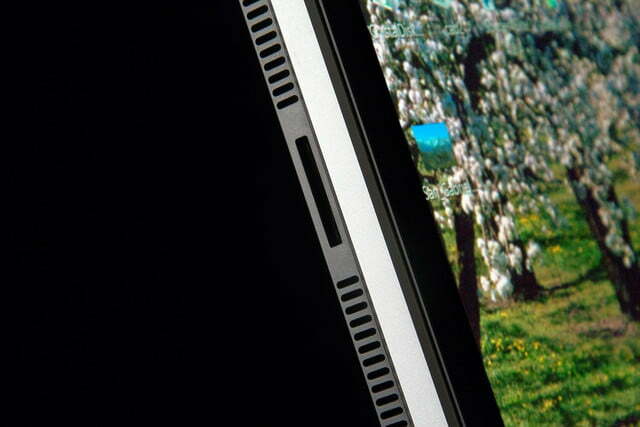 Viewing a 5K photo on the UP2715K is likely to sell you on the benefit of pixel-dense displays on its own. It’s a stunning experience that’s literally indescribable. You have to see it for yourself to really understand. Yet high-resolution photographs are a tiny sliver of what you’ll view. Most video available on PC remains stuck at 1080p (for now, at least) and web pages are usually formatted to fit in a space as narrow as 1,000 pixels. Does 5K really offer a benefit in normal use? You’d expect over two grand to buy a monitor that looks nice even when it’s turned off. That’s what Dell has delivered. Yes. The advantage is most obvious in fonts, particularly those rendered in Web browsers. You may not even notice the pixilation surrounding text on your current display, but one look at the UP2715K makes the difference instantly noticeable. One Digital Trends staff member, passing by the 5K display and a Dell U2713HM sitting next to it, remarked that the latter, which has a 1440p panel, “looked like crap.” The U2713HM was arguably the best mid-range 27-inch monitor on the market just a year ago, but it looks ancient by comparison. Editing high-resolution photos and video is great, too, because it’s possible to work at full resolution while also viewing tools or other windows. In a way, then, it’s accurate to think of 5K as the new 1440p. The advantage of 1440p over 1080p, besides greater pixel density, was the fact it let users edit at 1080p with room to spare. 5K allows the same for 4K content. The downside, though, is mediocre reproduction of 4K and 1080p media. 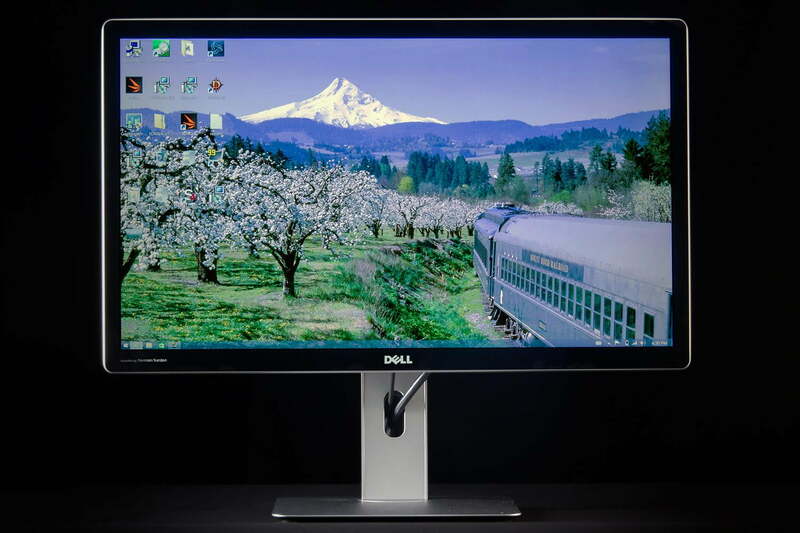 Dell’s monitor is so sharp, and so beautiful, that the failings of content are immediately noticeable. This is most apparent in 4K trailers on YouTube, which look positively dull next to 4K trailers obtained from other sources. 1080p is downright fuzzy, like viewing standard definition cable on a full HD television. Games look beautiful when they support 5K, but performance is an issue. Even a pair of GTX 980s in SLI struggle to play the latest 3D games at 4K, never mind 5K, which bumps the pixel count significantly. Fortunately there is a middle ground; 2,560 x 1,440, which is exactly half of 5K and, as a result, scales extremely well. Readers interested only in gaming should buy a 1440p monitor, but retreating to that resolution is a valid choice if you want the UP2715K for other reasons and enjoy an occasional bout in League of Legends or Diablo 3. The Nvidia GTX 960 is the least expensive choice for pushing pixels to Dell’s 5K masterpiece. 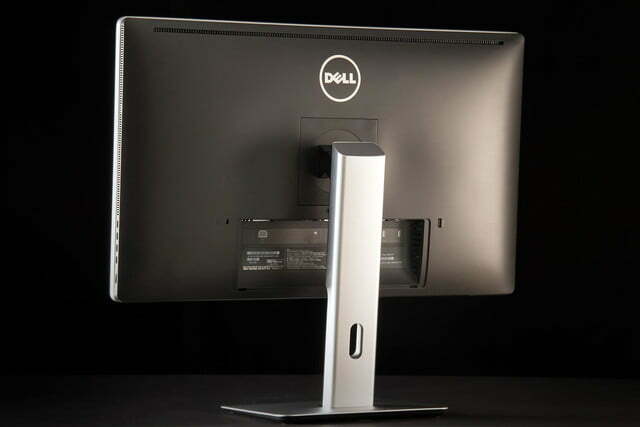 This articulating arm for 27-inch monitors can support Dell’s display and provides a wide range of adjustments. You’ll need this cable to display 4K from a desktop lacking a native Mini-DisplayPort connection. This calibration utility is what we use in our testing, and helped us improve on the UP2715K’s out-of-box color accuracy. The UP2715K is amazing. And you probably shouldn’t buy it. 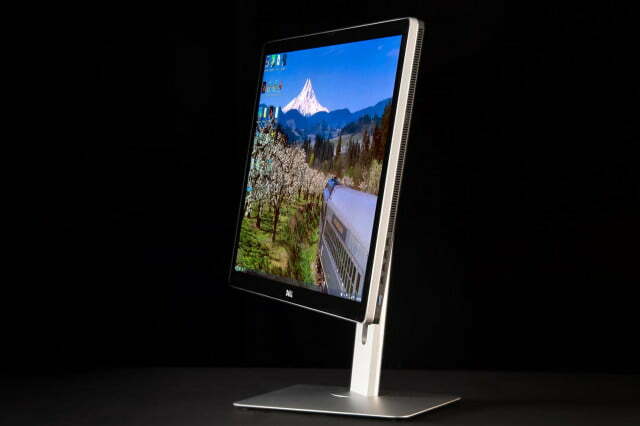 Dell is pushing the edge of technology with this display. While Apple’s iMac with Retina came first, it also isn’t usable with external input, which means Dell can still claim the title of “world’s first 5K monitor.” There’s nothing else like it in the world of Windows and unlike the iMac’s display, which will go obsolete once the hardware inside is too slow, the UP2715K should enjoy a long life. As you’d expect, given the $2,500 price tag. And that’s the problem. Like 4K monitors the launched in early 2014, this beautiful 5K display is way outside the price range of most buyers. Even photo and video editors considering the display for work will gain some benefit from waiting, as displays like this will probably cost half as much by early 2016. The early adopter tax is high, and while Apple’s all-in-one alternative handcuffs buyers to their hardware, it offers better value by bundling approximately a grand of equipment with a 5K panel. We love this monitor. It’s so beautiful we’d be content to load it with high-resolution photos and use it as a glorified electronic picture frame. If we were spending our own cash, though, we’d go with Dell’s P2715Q and save the rest for a rainy day. Samsung's Galaxy Fold is the company's first foldable phone, with two screens, six cameras, and a dual-cell battery. The phone may be delayed due to display issues, but that doesn't stop us from asking -- what's it like to use? Top of the line ultrawide monitors have the deepest curves, the sharpest colors, and the biggest screens on the market. You’re going to want one, sooner or later. So why not sooner? These are the best ultrawide monitors you can buy now. What are the best gaming monitors you can buy right now? We select five that are all priced under $900 packing premium technologies like G-SYNC and FreeSync, high resolutions, and fast refresh rates. Amal and George Clooney want to change the world. Can Microsoft help? If you can’t decide if you need a tablet or a notebook, then don’t bother. The best 2-in-1 laptops are both, and they can provide all the power you need. Check out our list for the best 2-in-1s for any user. With so much choice out there, how do you know which are the best 13-inch laptops? They should have beautiful screens, long battery life, and remain light and portable. This is a list of our favorites. Want to edit faster? Skylum Luminar's latest update enhances the Accent A.I. to use machine learning for instant enhancements. The tool now recognizes faces for more natural skin tones along with other enhancements. Intel may never release a competitive 10nm CPU on desktop if a new roadmap is to be believed. It suggests that Intel will rely on its 14nm process to at least 2022 and perhaps even beyond. Corsair is adding wireless capabilities to its Ironclaw gaming mouse this year, while the Glaive RGB Pro has been updated for maximum comfort with thoughtful ergonomics. Both mice feature accurate tracking and durable buttons. Looking for a budget notebook for school, work, or play? The best budget laptops, including our top pick -- the Asus ZenBook UX331UA -- will get the job done without digging too deeply into your pockets. Not a fan of the colors in your graphic, but dreading the process of replacing each and every one? Adobe Illustrator could soon have a new tool that recolors an entire vector graphic at once, using the color palette from a photograph.